Karnataka on Saturday celebrated the 269th birth anniversary of erstwhile Mysore (Mysuru) ruler Tipu Sultan and the one person who was conspicuously missing from the festivities was Chief Minister H.D. Kumaraswamy. Security was tightened as the Bharatiya Janata Party (BJP) protested against the Vidhana Soudha celebration comemorating “tyrant Tipu” that was eventually presided over by Water Resources Minister D.K. Shivakumar of the Congress. Minority Welfare Minister B.Z. Zameer Ahmed Khan and Culture Minister Jayamala of the Congress were also part of the celebrations, although its alliance partner — Janata Dal-Secular (JD-S) — stayed away from the state-sponsored event. In fact, Kumaraswamy’s name was missing from the official invite. The Chief Minister’s office though said that he was resting for three days from Saturday on the advice of his doctors. Celebrations were also held across the state’s district headquarters despite the BJP-sponsored protests. “Government is observing the birth anniversary of Tipu Sultan all over the state. Tipu’s progressive measures in administration, his quest for innovation are commendable,” a statement from Kumaraswamy’s office said. “The Chief Minister is taking rest on doctor’s advice, and hence is unable to take part in the programme. It is far from truth that he isn’t taking part due to the fear of losing power, as he opposes such blind beliefs,” the statement added. “Parameshwara had few prior engagements due to which he had to visit Singapore,” Minority Welfare Minister Khan told reporters. “CM Kumaraswamy missing! While Congress-JD-S government is celebrating a tyrant Tipu, the CM himself goes into hiding, what is the point of celebrating a fanatic when CM himself abandons a government function. “Glorifying a mass murderer for vote bank clearly shows mindset of this government,” the state unit BJP tweeted. 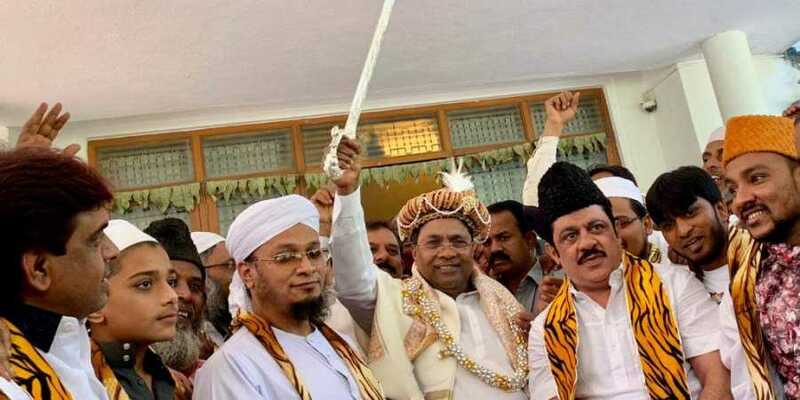 Khan, along with few Muslim clerics, visisted former Chief Minister and senior Congress leader Siddaramaiah’s residence in the city and presented him a sword and traditional headgear similar to that worn by Tipu. The eldest son of Sultan Hyder Ali, Tipu (1750-1799) is also hailed as the “Tiger of Mysore” for fighting the British East India Company’s advances and protecting his kingdom. Celebrating Tipu’s birth anniversary was the coalition government’s way of appeasing the Muslim community, state BJP chief and former Chief Minister B.S. Yeddyurappa had said in 2015.